"On average we document around 40 elephant seal predation events by white sharks at Southeast Farallon Island each season," Anderson said. "After orcas show up, we don't see a single shark and there are no more kills." "These are huge white sharks. Some are over 18 feet long (5.5 meters), and they usually rule the roost here," Anderson said. "We've been observing some of these sharks for the past 15 to 20 years—and a few of them even longer than that." The study's findings highlight the importance of interactions between top predators, which aren't well-documented in the ocean. "We don't typically think about how fear and risk aversion might play a role in shaping where large predators hunt and how that influences ocean ecosystems," Jorgensen said. 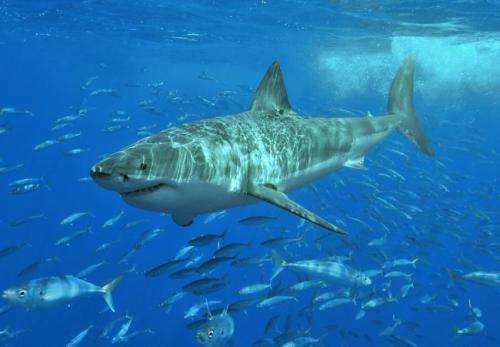 "It turns out these risk effects are very strong even for large predators like white sharks—strong enough to redirect their hunting activity to less preferred but safer areas." "I think this demonstrates how food chains are not always linear," Jorgensen said. "So-called lateral interactions between top predators are fairly well known on land but are much harder to document in the ocean. And because this one happens so infrequently, it may take us a while longer to fully understand the dynamics." if he was alive today.